Neue pathophysiologische Konzepte in der Neuroimmunologie – Von der Entzündung zur Degeneration? Transfer of exosomes from myelinating glia to neurons: “goodies" for neuronal fitness? The 41th edition of the NDI3 symposium will take place at the Research Center Borstel on November 16 2018. The novel NDI3 program – New Developments in Immunology, Inflammation and Infection – with its innovative agenda promises an expanded spectrum of scientific research topics and a high level of interdisciplinarity. In the line-up are current and exciting topics, interesting talks by leading international scientists and the opportunity to win great prizes. In addition to the possibility to be engaged with other researchers, all within the comfortable atmosphere of a small scientific conference. The aim of the seminars is to give students and scientists an overview of the range of technologies and methods offered by the Core Facilities. Attendees will get new ideas for their own projects and can benefit from interdisciplinary exchange. More and more often is research using animals being placed on the spotlight, and if your work in the lab entails the use of animal models, then you might have a personal opinion on that. Take the opportunity to participate in the "Doktoranden-Wettbewerb für Wissenschaftsvermittlung" and stand the chance to win 1000 euros. ImmunoSensation together with University of Bonn communication department will support those who want to participate in shooting the videos. if you are interested, get in touch with Dr. Patricia Korir; pkorir(at)uni-bonn.de. Course includes lectures, skills and tool box sessions, hypothesis generator, paper presentations and discussion on the latest advances in the field of neuroinflammation. We are please to announce that applications for fellowship for the DGfi Autumn School 2018 are open. The fellowship covers the registration fee including: courses, accommodation, full board and social program. Applications for the fellowship will only be accepted via our eTraining system. To open an application, please send an email to Alexandra.kraemer(at)uni-bonn.de. The Caesar welcomes you to the Max-Planck-Day on the 14th of September 2018. "Kleines Gehirn, große Leistung: Die Fruchtfliege als Modellorganismus der Neurobiologie"
"Was wir von der Fruchtfliege lernen können"
BIGS Neuroscience lectures: Gabriela-Oana Bodea, Dr.
We are pleased to invite applications to the European Summer School onEye Movements (ESSEM) 2018! We are please to announce this year's Summer School on "Immunology meets Technology". Applications are now open and limited to 28 participants, for more information regarding the speakers and application, see the attached poster. The University of Bonn Excellence Clusters, ImmunoSensation and the Hausdorff Center for Mathematics, will hold a joint science slam at the Arkadenhof of the University of Bonn. The two Clusters will be supported by the student initiative iGEM team Bonn. Science Slam provides the opportunity for scientists to share their work in a fun and interactive manner! Both teams have invited 3 slammers who will present in their respective topics, biomedicine & mathematics. Co-Director, Marian S. Ware Center for Alzheimer's Discovery Program, Perelman School of Medicine at the University of Pennsylvania USA. As part of the events to celebrate its 200 years anniversary, the University of Bonn will have several programs and exhibitions at the Villa Hammerschmidt. 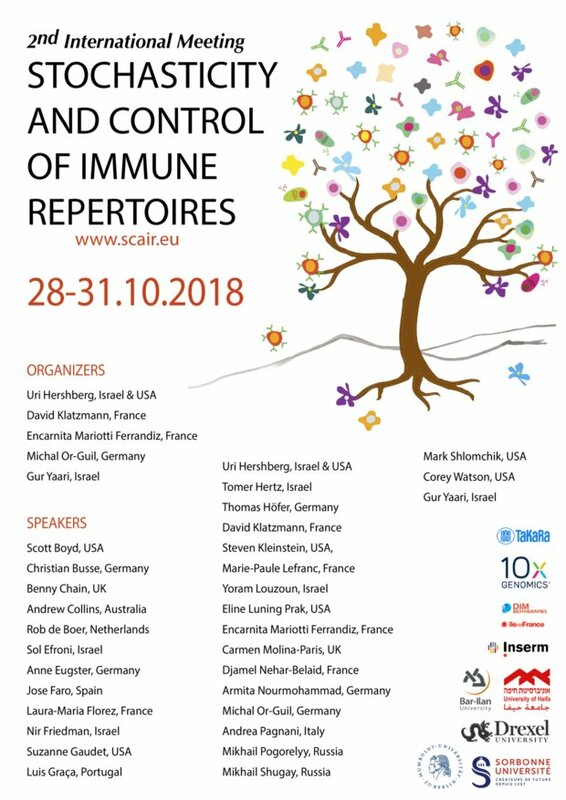 We will also be present to represent ImmunoSensation, so join us at tent No. 22, marked as Global health on the flyer. The 13th EFIS-EJI Tatra Immunology Conference will include lectures by invited speakers, poster presentations by other participants and informal discussions combined with extended midday recreational activities. The aim of the organizers is to have the conference in a style similar to the Gordon Conferences, i.e. with a lot of informal discussions and no written proceedings. Participation is limited to approx. 120. If you are interested in participating, please register electronically via this site before February 28, 2018. You will be informed that your registration has been recieved and will be given the details about conference fee payment. Several poster presentations will be selected for brief oral presentations. The conference fee is 400 EUR and includes conference programme, 4 nights of accommodation (in single or double rooms), full subsistence, evening social programme, transport from the nearest airport (Kosice) and several trips during midday breaks. A limited number of student fellowships (registration reduction by 200 or even 400 EUR) will be available upon request. More information about the stipends can be found in the section Fellowships. Für Music & Brain zum 200. Jahrestag der Bonner Universität konnten wir den international renommierten Geiger ALEXANDER GILMAN und Mitglieder seiner LGT YOUNG SOLOISTS gewinnen. Es stehen Streichquartette von Mozart und Dvorak , sowie ein Trio von Dohnanyi auf dem Programm. Date: Monday, May 14th 2018 at 6:00 p.m. The program will start with a lecture by Prof. Dr. Wolfgang Hoffmann, entitled “Who and what constitutes good care for people with dementia? Findings from health care research by DZNE”. The lecture will be followed by a chamber music recital of outstanding students from Cologne and New York featuring works by Johannes Brahms and Augusta Reade Thomas. Let's all celebrate the beauty of Immunology. On Saturday, May 5th from 10 am until 6 pm we will have a big tent on the Marktplatz Bonn displaying big walk-in organ models. Psychiatrische Erkankungen - welche Rolle spielen die Gene? Bei der Entwicklung von psychiatrischen Erkrankungen spielen Gene eine wichtige Rolle. Welche Gene jedoch an Leiden wie etwa der Schizophrenie beteiligt sind, war bis vor wenigen Jahren kaum bekannt. Mit Methoden der modernen Molekulargenetik konnte mittlerweile eine große Zahl dieser Gene identifiziert werden. Doch helfen die genetischen Befunde, die Ursachen psychiatrischer Erkrankungen besser zu verstehen? Werden genetische Tests künftig die Diagnose erleichtern und die Entwicklung neuer Medikamente ermöglichen? Und kann man mit genetischen Tests das spätere Auftreten psychiatrischer Krankheiten vorhersagen? Diese Fragen beleuchtet der Humangenetiker Markus Nöthen in seinem Vortrag. Er wird aber auch auf die Grenzen genetischer Erkenntnisse eingehen und darstellen, wie weit die Forschung noch von einem umfassenden Verständnis über die Ursachen psychiatrischer Erkrankungen entfernt ist. Introductory course „Get started with HTRF (Homogeneous Time Resolved Fluorescence)"
All scientists, students and technicians are invited! If you don’t know how to register, please contact us! For those attending the practical course: hands on cell-based phosphoprotein and cytokine assay kits. From assay preparation to measurement. After the seminar you will have the opportunity to sign up for a practical course (one month later; date will be doodled). Cluster Seminar by Prof. Michael Boshart - start 2pm ! Dr. Yoko Nagai, B.Sc., Ph.D. The DZNE cordially invites you to the 43th installment of our Music & Brain series on Monday, 22th January 2018 at 6:00 pm at the LVR-LandesMuseum Bonn, Colmantstraße 14 - 16, in 53115 Bonn. In his talk “Maps in the brain” Prof. Dr. Thomas Wolbers will present the latest n- dings on the sense of direction, a key cognitive ability that often deteriorates in old age and in dementia patients. How does the brain enable us to navigate our complex environments, how do people with a good sense of direction differ from those with a bad sense of direction, and how does this ability change in old age? Since 2012, Prof. Dr. Wolbers has been heading the “Aging and Cognition” research group at the DZNE Magdeburg. His research program aims at understanding which alterations in the brain lead to memory decline in old age and what can be done to prevent it. Following the presentation will be a recital featuring works by Mozart, Schubert and Liszt et al. for soprano, piano and clarinet. Cluster Seminar by Ari Molofsky, M.D. Cluster Seminar by Dennis M. Klinman, M.D. We are pleased to announce that this year's Cluster Science Days will be jointly held with the SFB 704 Symposium. Together we present the Bonn Immunoscience Days 2017! What else? Don’t miss the conference party on November 14, 2017! It’s for free! Registration and abstract submission are now open. Participation in the meeting is free of charge and open to everyone who is interested. Childcare during the meeting is provided. CME Points for doctors are available. For more information please contact Nicole Dahms (immunosensation(at)uni-bonn.de). The deadline for registration and abstract submission is September 25, 2017. Registration without an abstract is open until October 13, 2017. We are looking forward to seeing everyone at the Bonn Immunoscience Days 2017! The novel NDI3 program with its innovative agenda promises an expanded spectrum of scientific research and, hence, a high level of interdisciplinarity. Expect current and exciting topics, interesting talks by leading international scientists, fruitful discussions with other researchers and gaining the opportunity to win great prizes.We kindly invite you to register and submit your abstract for poster or oral presentation bySeptember 24th, 2017For registration and further information visit our homepage: http://ndi3.fz-borstel.de. You can register here until October 16, 2017. On behalf of the Bo&MeRanG and the ImmunoSensation Cluster we are delighted to invite you to participate in our joint Symposium on Inflammation in organ disease that will take place in Bonn on the 9th of October 2017. The symposium aims to provide our outstanding students and early career scientists with a special platform to present their work as well as to gather and network with renowned immunologists. For registration please send an e-mail to: bomerang@uni-bonn.de, No registration fees are required. Please send your abstract to the following address: bomerang@uni-bonn.de until the 1st of September 2017. Author names should be formatted as the following example: Delforge C1. Please let us know whether you prefer to give a talk and/or present your data as a poster. A limited number of abstracts will be selected for oral presentation. All other abstracts will be presented as posters. For symposium participants who have children we will provide a joint on-site childcare service. Please let us know until the st of September 2017 if you need this service, number of children you will drop off and the time you will require. Können unsere Zellen denken und dürfen sie das? It is our pleasure to remind you of our 2nd CEWIS Symposium in Cologne, scheduled for Thursday, October 5th and Friday, October 6th, 2017.The mission of CEWIS is to spotlight extraordinary women in biological sciences as speakers http://cewis.uni-koeln.de/15219.html . BIGS Neuroscience is excited to announce that visiting Professor Dan Peterson will again be offering a workshop on confocal microscopy and stereology. The Workshop in Microscopy and Quantitative Histology is open to graduate students, post-docs and PIs. The workshop is supported by the DAAD and the Helmholz association. It will consist of 2 days of theoretical lectures, followed by 3 days of hands-on practical work with confocal microscopy, including image acquisition and processing. Equipment and software has been generously provided by Zeiss, Nikon Instruments, and MBF Bioscience. Lectures are open to all, but there is a limit of 20 places for the practical portion of the workshop. We would like to announce the joint symposium from the Hausdorff Center for Mathematics & ImmunoSensation on August 28 & 29, 2017. No registration needed & no registration fee. Bonn Lecture Series in Neuroscience by Michael Wenzel, M.D. Navdeep S. Chandel graduated from the University of Chicago with a bachelor of science in Mathematics in 1991. He earned his doctoral degree with Paul T. Schumacker, Ph.D. at the University of Chicago Pritzker School of Medicine in 1996. Dr. Chandel’s completed his post-doctoral work jointly with Dr. Schumacker on mitochondrial dependent oxygen sensing and Dr. Craig Thompson on mitochondrial dependent apoptosis at the University of Chicago in 1999. In 2000, Dr. Chandel established his laboratory at Northwestern University Feinberg School of Medicine at Northwestern University on understanding how mitochondria and metabolism can affect changes in cell functions and cellular signaling. A key interest of the Chandel lab is to elucidate how mitochondrial metabolism contributes to immune cell signaling and tumor formation. Dr. Chandel has published 180 papers and is the author of “Navigating Metabolism” (Cold Spring Harbor Press), an introductory book to metabolism. Find the poster here and here.